With Everton set to take on Manchester United this evening, we take a look at a former Blue who made a significant impact against the Red Devils. Manuel Fernandes enjoyed two loan spells at Goodison Park and came incredibly close to completing a permanent transfer to Everton only for last-minute complications to dash any hopes of a big money deal. It was during his first spell on Merseyside when he scored a memorable goal against United, lashing the ball into the Gwladys Street net to seemingly put the Blues on course for victory. Typically United fought back to claim the three points, but after he left Everton in 2008, what happened to the talented Portuguese. If Manuel Fernandes was brilliant during his first spell with the club, he was anything but when he returned to the club a year later. Fernandes had become a firm fans favourite after impressing on loan during the 2006-07 season and the clubs faithful support were devastated when his permanent transfer broke down over complications with third-party ownership. It proved to be a fortunate escape, with Fernandes joining Spanish side Valencia for £12.2m, and failing to justify that substantial outlay. 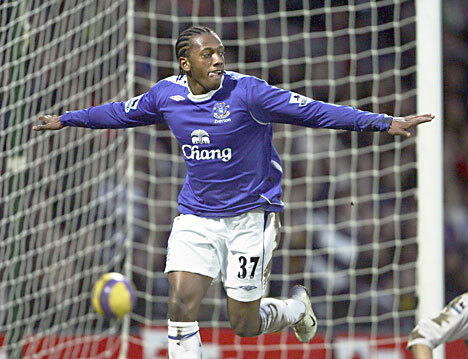 He returned to Everton in January 2008 for a second loan spell, but his confidence had taken a significant nosedive and he looked a shadow of the player who had graced Goodison Park 12 months previously. He returned to Valencia for 2008-09 season and looked back to the form which had made him a much sought after player, playing regularly as Valencia finished 6th in La Liga despite battling crippling financial difficulties. However towards the end of the campaign, Fernandes suffered a broken fibula, which would end his season and pretty much brought an end to his time as a Valencia player. With his career at the top of European football seemingly at an end, Fernandes secured a move to Turkish side Besiktas, initially on loan, before he completed a permanent £2m transfer, representing a huge loss on the fee Valencia had paid for him just 4 years previously. Fernandes has enjoyed a brief renaissance in Turkey and is often banded about for a transfer back to the Premier League, however the Manuel Fernandes story is one of massive under achievement. He has failed to maximise his potential and he appears to have settled for the huge and relatively tax-free wages on offer in Turkey, rather than pushing himself to become one of Europe’s top midfield players. At a time when the Portuguese national team is in decline, Fernandes has managed just 9 international appearances and has not appeared in the squad since 2012.